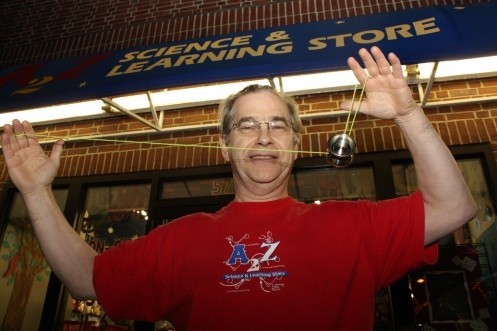 Daniel Dietz was in 6th grade in 2004 when he took a yoyo class at the A2Z Science and Learning store in Northampton. He was lucky to live so close. Serious yoyo schools are unusual; there are less than 10 in the United States. Serious yo-yoers are more common; they practice incessantly, and show up by the thousands at yoyo contests and yoyo conventions where they learn, share, and compete. Dietz became a serious yo-yoer. “I never played an instrument, but the yoyo became my creative outlet, especially when I discovered early on that I could make up my own tricks.” It helped that there was a yoyo craze in the Hilltown Cooperative Charter School that he attended. As Daniel put it, “every kid and their brother had a yoyo.” Many other students also took lessons at the A2Z School. Dietz learned quickly. In 2006, less than two years after taking his first yoyo class, he entered the World Yoyo competitions in Orlando Florida and came in first in his age group. 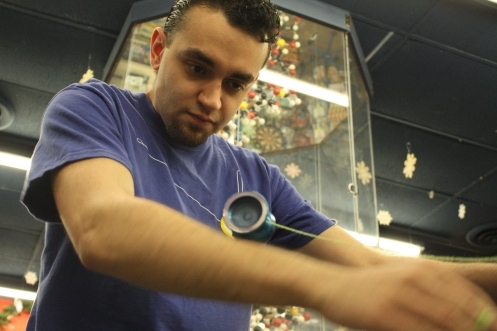 In 2009, he became the Massachusetts yoyo champion and then placed 4th in the overall World Yoyo championship. Boulay, like Dietz, had discovered that top level yo-yoing was a form of personal expression that required the same commitment to excellence as learning an instrument or a sport. Artistry at this level goes well beyond the usual ‘walk the dog’ and ‘around the world’ tricks that many of us learned as kids. High-level yo-yoers throw or spin their yoyos in, out, or through a succession of complex geometrical shapes and patterns that they create with the string to which the yoyo is fastened. They move from one shape to another, swinging the yoyo sometimes at almost blinding speeds, while other times sleeping the yoyo (spinning on its own axel) motionlessly before moving to the next pattern. It is an activity that requires gymnastic precision and jazz drummer timing; it is part performance art and part sport. Nick Gumlaw was another one of Daniel Dietz’s teachers who discovered yo-yoing at the A2Z store. “They had these weekly game nights, and a yoyo class was going on before that. I had never seen anything like the kind of yo-yoing that they were teaching, and it looked really interesting. ” Gumlaw was 12. By age 14, he was taking three classes a week and yo-yoing four hours per day. At 16, he placed third in the World Yoyo Competition for his age group. Like Dietz and Boulay, Gumlaw went on to teach at the A2Z School. Today, at age 24, he is a judge at yoyo competitions worldwide and still teaches at the A2Z School. Moreover, Gumlaw has created his own yoyo company, Spin Dynamics, which designs professional quality yoyos such as one that can “sleep” (spin) for eight minutes while moving at 10,000 RPMs. The Smooth Move yoyo costs around $100, a price that is now considered reasonable for professional quality yoyos. Master yo-yoer, Eric Kolaski, explained how Jack taught him basics from yoyo maintenance to beginning tricks. Like Daniel Dietz, Kolaski remembers enrolling in the A2Z School during a “huge yoyo fad” in his East Hampton elementary school, back in first grade. To keep kids motivated, Jack would offer incentives for passing different proficiency levels. “You passed level one and you would get a free packet of strings, you passed level three and you would get a free t-shirt, and so on.” Kolaski mastered his lessons well. In 2005 at age 14, Kolaski won the Massachusetts state yoyo championships. He went on to win the regional championships several times, and then in 2008, Eric became the United States National Yoyo Champion in the “1A” division (the main event). The impact was felt both in areas of creativity and competition. Some of the other major players connected with the Northampton school include Bret Outchunis, now chief demonstrator of Yomega yoyos, former artistic world champion Mark Montgomery, and respected competitors David Almandzar and Sean Fumo. According to Jack Finn, almost every state and regional champion has been connected to A2Z since 2003. John Higby’s long distance journey to the Northampton community began, at age 11, in his hometown of Anchorage, Alaska. John’s grandfather gave him a classic Dunkin butterfly yoyo, and taught him basic tricks. Intrigued, John sent away for the Dunkin yoyo company’s trick book and learned all 21 tricks. He was hooked and soon bought a newly invented Silver Bullet ball bearing yoyo, which could spin much longer than the traditional axle yoyo, along with another trick book called the Flight Manual. John learned those tricks, too. In fact, he learned them so well that four years later, in 1996, he tried out and was selected to perform for US servicemen stationed in the Mediterranean, in a Department of Defense tour. In 2008, Higby won the World Championship in the artistic division. His winning routine was a “street show,” complete with a cardboard subway stop. Higby would step behind the cardboard and pantomime going down an escalator into the subway. Each time he came back up, Higby carried a different yoyo and performed different tricks. I saw Higby perform at the public library in Acton, Massachusetts. His routine mixed dazzling yoyo tricks with comedy. People were laughing one minute and “wow”-ing in amazement the next. In one routine, Higby attempted to nock a quarter off of the ear of a nervous volunteer – who of course had no idea for what he was volunteering. Higby first reassures his volunteer with several comments that are none too comforting – but sure were funny. Then he stands at a considerable distance – swinging around a yoyo with an extra-long string. Finally, Higby throws the yoyo and, after a few false starts, nocks off the quarter with surgical accuracy. Daniel Dietz, as a mitzvah (good deed) project for his bar mitzvah, chose to donate money through his yoyo performances to the Smile Train, an organization that provides surgery and care around the world for children with cleft lips and cleft palates. Dietz kept going long after his bar mitzvah. Today, at age 18, Dietz has personally raised almost $40,000 for the Smile Train, which, at $250 per surgery, has financed life-improving operations for 160 children. Dietz still competes at world championships and believes that he not yet reached his full potential. And he still teaches at the A2Z School. André Boulay no longer teaches at the A2Z School though he remains highly connected to the community and attends the monthly Dogbite gatherings. Today, Boulay judges at major competitions and teaches to a world community through the video tutorials on his Yoyo Expert website, which attracts over 150,000 hits per month. This site, according to world champion John Higby, provides huge benefits to yoyo-ers worldwide (especially those not lucky enough to live near a community like Northampton) with information and video tutorials. “André deserves credit for getting so many people into it,” Higby explains. National Champion, Eric Kolaski, teaches at the A2Z School and has discovered that his yoyo skills can help inspire and motivate people. One especially memorable episode came out of a series of unplanned events. In the summer of 2009, talent scouts from the television show, America’s Got Talent, discovered YouTube videos of Eric performing in competition and invited him to tryout for the show in New York. Eric passed the try-outs and appeared on national television (and met Howie Mandel and Sharon Osborne along the way). A pastor in Georgia saw the show and invited Eric to perform during a church service. As Eric recalls, the sermon was about achieving excellence through persistence and practice. At the conclusion, a video of Eric appeared on a large screen for the 3000-member congregation. When the minister asked whether people would like to see Eric in person, Eric made his appearance, and performed a 2-minute yoyo routine. “The congregation loved it,” Eric said, and several truly inspired members asked him how he had developed his talents. World champion, John Higby, who directed the A2Z Yoyo Team in their annual First Night performances, no longer competes but is active as both a performing yoyo artist and as a visual artist where, not surprisingly, the yoyo is a dominant theme. Using typing paper and mechanical pencils, John has created Mr. Yodel, a yo-yoing comic book character. He has also drawn yoyo-themed portraits, created designs on the inside of yoyos, and published illustrations in children’s books. 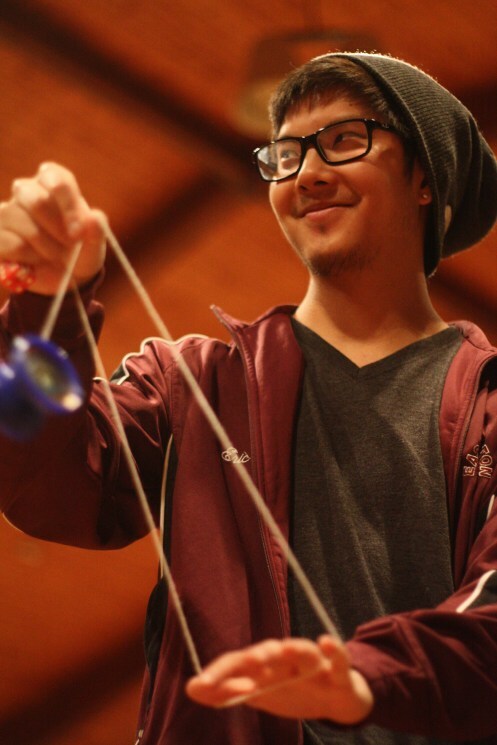 As a yoyo master, John has performed in 26 countries at company banquets, arts festivals, street fairs, cruise ships, and even at Disney world. John also has set two Guinness world records. In Spain, using a yoyo with an extra long string, John knocked off 15 coins from the ears of 15 participants in one minute and fifty seconds. Maybe the volunteer at the Acton library would have been more relaxed if he knew that Higby was the record holder in this event! However, that kind of accuracy pales in comparison to his second world record. 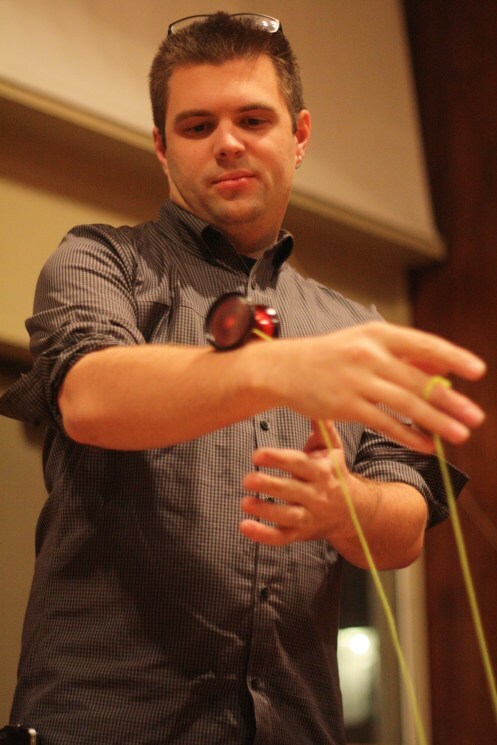 In August 2011, in Beijing, China, Higby lit 14 matches (held by 14 different participants) with a yoyo in 60 seconds. Yo-yoing is one of the oldest arts/sports/recreations in the world. According to different sources, the yoyo was invented either in China, the Philippines, or Greece, between 500 and 1000 BCE. In the 18th century, the yoyo came to Europe, probably via India to Britain and France, where it was especially popular among nobility. It arrived in the US in the 1860s and was referred to by its then British name, the “bandalore.” In the 1920s, Pedro Flores, a Filipino immigrant to the US manufactured a toy similar to the bandalore and called it the “yoyo,” which, in Tagalog, means “come back.” Nine years later, Donald Duncan bought the company from Flores and trademarked the “yoyo” name. Today, yoyo players from twenty-one countries in five continents are represented in the world yoyo championships, in Orlando, Florida. The strongest team usually comes from Japan, where yo-yoing is most popular. However, top players come from most countries, including China, Singapore, Canada, England, and of course the United States. Here in the United States you can find other thriving yo-yoing communities in Cleveland, Chicago, Denver, Wilmington Delaware Chico, California, home of the national championships, and Orlando, Florida, home of the world yoyo contests. An activity cannot remain popular for 3000 years without appealing to people in different ways and on different levels. In my discussions, yoyo aficionados from beginning to master level players passionately discussed their addiction. Size and portability are definitely part of the attraction. John Higby explained how he would practice his yoyo during “all those moment when you are waiting in line.” He added that the yoyo was a great “ice breaker” for meeting people, especially in countries where he didn’t speak the language. And so it goes. As befitting one of the world’s oldest toys, different people are attracted for different reasons: creativity, individuality, social “ice breaker,” sport, and form of relaxation. In the classic baseball movie, Field of Dreams, an Iowa corn farmer makes his own baseball field after hearing a voice tell him, “If you build it, they will come.” Jack Finn built a yoyo school in Northampton, and people came. A list of all articles is on left side of page, near the top. And as a Noho resident I can confirm that yoyo day at A2Z is indeed quite a scene. Interesting posting, David. I could not stop reading until the end! It's in Burlington, Wisconsin, outside of Chicago. But if you have a strong desire to see yoyos (compared to tops), call ahead. She has SOOOOO much stuff, she can only display one of these per day. But she can turn the museum around to the other in a few hours. We got to see tops and I will never forget the experience. The woman who runs this is also quite a character. Wow. Who knew? When I was a kid, I considered it an accomplishment when I could get the yoyo to go straight up and down more than 3 times without ending up in a knot. A nice, refreshing article, Mr. Gilfix.